Those who approach it with healings. On the twenty-fourth we celebrate the Lady Filerimos. The Holy Monastery of the Panagia of Filerimos is situated amid idyllic scenery on Filerimos hill that dominates the namesake bay at an altitude of 247 meters. Following the main road from Rhodes Town to Ialyssos and turning left on the Ialyssos main crossroad you will reach the foot of Filerimos hill. The site appears to have been attractive from ancient times. The Acropolis of Ialyssos and the ancient temple of Athena Poliados, which, in the 5th century A.D., became a Christian three-aisled basilica, were at the same location. The only remains of this basilica is a cross-shaped font. Passing through the eastern gate, a wide stone staircase, with tall cypress trees right and left, leads us to the Monastery of Panagia Filerimos dedicated to the Zoodochos Pigi (Life-Giving Spring). The church complex was built by the Knights of Saint John over an older Byzantine church and was rebuilt in its present form by Italian archaeologists. Right next to the font is the restored stone Gothic church. 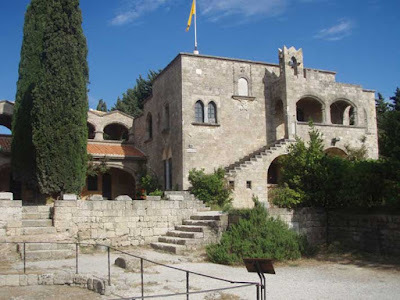 To the left of the main entrance of the site at a lower level of the monastery there is a small one-room underground Byzantine church dedicated to Saint George of Hostou, of the pre-knight era, with rare frescoes depicting the knights and dating from the 14th-15th century. 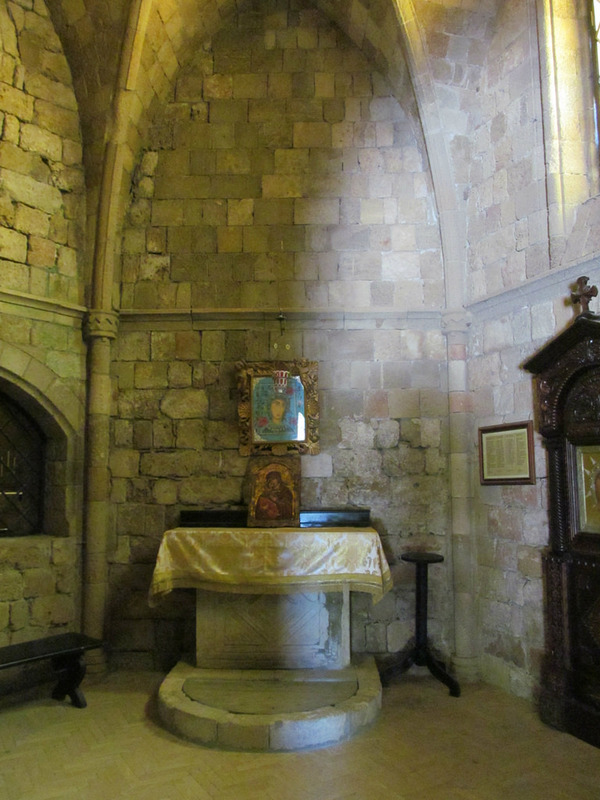 Opposite the entrance of the site and outside the fence begins the so-called path of Golgotha, known also as the Via Dolorosa, a paved corridor with twelve engravings on one side, standing on pedestals, which represent the Passion of Christ. The path ends at a Crucifix of 17.80 meters tall. Inside, a staircase leads to the top of the Cross offering a breathtaking panoramic view. A few steps down the hillside, is a partially restored Doric fountain with six Doric columns and an equal number of columns in the interior (4th century B.C.). The icon of the Panagia of Filerimos is one of the most important Christian treasures. The story of the icon seems to start from the 11th century A.D. The Virgin Mary's face was painted on canvas, which then was applied to the wood surface. Many believe that the icon comes from Jerusalem. Some historians argue that members of the Order of Saint John brought it to Rhodes to this location from which it got its name. Other historians say that the Order of Saint John found it on the island after its conquest in the year 1310, and that the residents had already established the Virgin Mary as their protector. The icon from 1200 to 1480 A.D. was located on the hill of Filerimos. In the year 1480 A.D. during the first Ottoman siege, the icon was temporarily transferred to the city of Rhodes on the ramparts to inspire the army. From 1490 until 1523 A.D., the icon moved several times in the Castle of the Knights due to the reconstruction of the church on Filerimos hill, after the 1480 A.D. invasion and earthquakes. 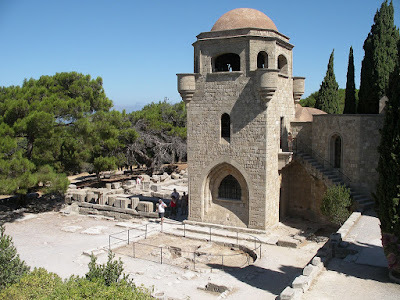 The last year, 1522 A.D., the icon moved back to the city of Rhodes during the second Ottoman siege, and was stored at Saint Katherine's Church and then at Saint Mark's Church within the Medieval Town. On January 2, 1523 A.D., the icon left the island of Rhodes forever to start a long journey through time and history. From 1523 to 1527 A.D. it was located in Italy, and from 1527 to 1530 A.D. in France. On the island of Malta, it was first in the Church of San Lorenzo from 1530 to 1571 A.D. and then at La Valletta, in the Church of Our Lady Beata Maria from 1571 to 1578 A.D. and finally the Cathedral of San Giovanni from 1578 to 1798 A.D. 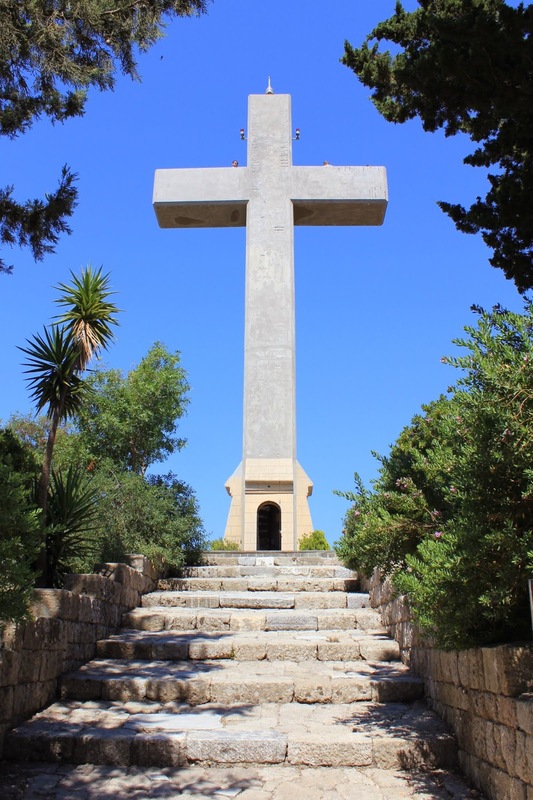 It is said that the icon had great power during its stay on the island of Malta, protecting it especially during the long Ottoman siege in the year 1565 A.D. When Napoleon occupied Malta in 1798 A.D., robbers while ravaging palaces and churches, removed the cover of the icon. The icon traveled through Trieste and arrived in Russia, where Tzar Paul I welcomed it with honors. 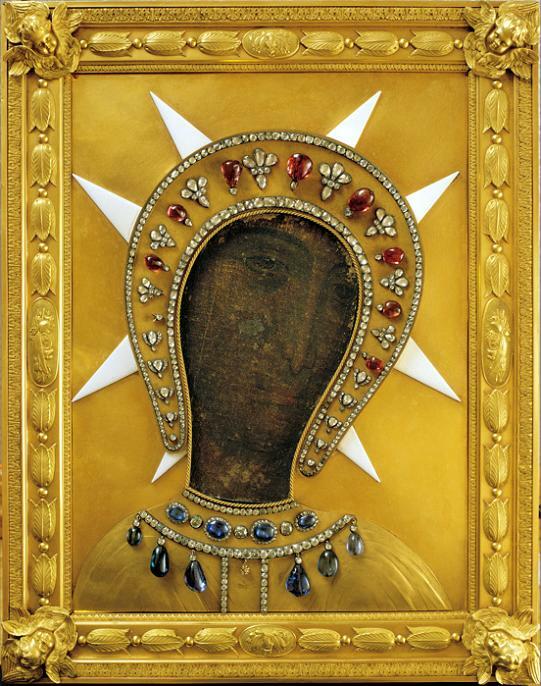 A new gold cover decorated it with additional expensive jewelry such as diamonds, rubies and sapphires were placed on the icon. At the Tsar's workshop, similar decorations were used in two other knightly relics that were with the Virgin Mary's icon, the hand of Saint John the Baptist and a relic of the True Cross. The icon stayed in Russia until the October Revolution in 1917, hidden in Moscow, then St. Petersburg, and then through Estonia in 1919 it was transferred to Copenhagen (Bei Di Ciaro). The icon was given to Maria Fyodorovna, the Queen Mother of Russia, who managed to travel to Denmark after the October Revolution. The icon remained in Denmark from 1919 to 1928. By order of Maria Feodorovna the three relics were moved to the Russian Orthodox Church in Berlin, where they stayed from 1928 to 1929. The royal family Karagiorgis kept the relics in their palace in Belgrade from 1929 to 1941. After the bombing of Belgrade on April 6, 1941, the relics were transferred to the Ostrog Monastery and remained there until 1952. Then they were taken over by the Montenegrin government and were placed in the National Treasury. In 1978 A.D. The government handed over the two relics in the official Church and now there are placed in the Monastery of Cetinje and the icon was delivered to the Museum of Cetinje. It is currently stored at the National Museum of Montenegro. Since 2002, the icon remains in the Blue Chapel of the National Museum of Montenegro. Today there is a copy of this marvelous icon at the Church of Panagia of Filerimos that was transferred by the Metropolitan of Montenegro and Serbia Amphilochios on September 24, 2008. The Monastery celebrates it feast on the Friday of Bright Week and on September 24th.